For the first time, scientists have mapped elevation changes of Greenlandic and Antarctic glaciers. For the new digital maps, the researchers evaluated all data by the CryoSat-2 altimeter SIRAL. Satellite altimeter measure the height of an ice sheet by sending radar or laser pulses in the direction of the earth. These signals are then reflected by the surface of the glaciers or the surrounding waters and are subsequently retrieved by the satellite. This way the scientists were able to precisely determine the elevation of single glaciers and to develop detailed maps. On the basis of further CrysoSat-2 the scientists also documented how the elevation has changed over the 2011-2014 period. Ice sheets gain mass through snowfall and lose it due to melting and accelerating glaciers, which carry ice from the interior of the ice sheet to the ocean. "The new elevation maps are snapshots of the current state of the ice sheets. The elevations are very accurate, to just a few meters in height, and cover close to 16 million km2 of the area of the ice sheets. This is 500,000 square kilometers more than any previous elevation model from altimetry," says lead-author Dr. Veit Helm, glaciologist at the Alfred Wegener Institute in Bremerhaven. "We need to understand where and to which extent the ice thickness across the glaciers has changed. Only then can we can analyze the drivers of these changes and find out how much ice sheets contribute to global sea level rise." The team derived the elevation change maps using over 200 million SIRAL data points for Antarctica and around 14.3 million data points for Greenland. 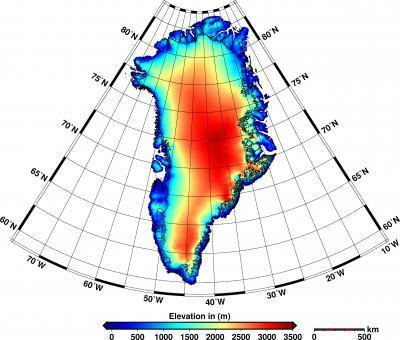 The results reveal that Greenland alone is reducing in volume by about 375 cubic kilometers per year. "When we compare the current data with those from the ICESat satellite from the year 2009, the volume loss in Greenland has doubled since then. The loss of the West Antarctic Ice Sheet has in the same time span increased by a factor of 3. Combined the two ice sheets are thinning at a rate of 500 cubic kilometres per year. That is the highest rate observed since altimetry satellite records began about 20 years ago," says AWI glaciologist Prof. Dr. Angelika Humbert, another of the study's authors. But whereas both the West Antarctic Ice Sheet and the Antarctic Peninsula, on the far west of the continent, are rapidly losing volume, East Antarctica is gaining volume – though at a moderate rate that doesn't compensate the losses on the other side of the continent.